I love cheese. If there is something competes with my love of chocolate or coffee, it would be cheese. Creamy brie, sharp cheddar, spicy pepper jack; I love them all! Well, good cheese. I've been known to call processed cheese 'plastic' and refuse to eat it. Yesterday I ventured into Vancouver for lunch at Forage in the Listel Hotel on Robson Street, where I got to visit with the people from BC Dairy, sample some delicious cheeses and meet with other bloggers. We learned about how cheese is made and heard about the Canadian cheese rolling festival that is going to be happening up at Whistler Blackcomb this Saturday August 16 from noon until 4 pm. What's a cheese rolling festival, you ask? Well. Let me show you. The Cheese Rolling Festival is an annual event in Whistler, hosted by the Dairy Farmers of Canada and great fun for the whole family. An 11 lb wheel of Courtenay Cheddar cheese from BC Cheesemaker Natural Pastures rolls down a hill and people chase it. The first to the bottom of the hill gets to keep the cheese, along with a Whistler season ski pass for two. It may not sound like a dangerous undertaking, but running full speed down a hill after a wheel of cheese requires some safety equipment like a helmet, and maybe some pads to protect your knees. Chasing cheese may sound a bit.. strange to some, but I had the chance to eat some Courtenay Cheddar, and trust me, it's delicious. Natural Pastures hails from Courtenay, BC and the interesting thing is I remember seeing their products years ago at the Comox Valley Farmers market when Kevin was just a little guy and we would check out the market for fun. It's so great to see how much they have grown over the years! The cheese is creamy and mild, perfect for snacking on with a good bread and sipping wine. We got to hold the 11 lb wheel of cheese that gets rolled down the hill and part of me wanted to slip it into my bag, whispering, "It's okay precious. I'll save you. No bumps and rolling through the grass and rocks for you, dear cheesy goodness." I think that an 11 lb wheel of cheese may have been a bit much to haul on Skytrain back home. We tried a few different dishes; a cheddar, sundried tomato and artichoke dip that I could've eaten with a spoon (and did) right there, a very tasty fennel, arugula, cheddar and pecan salad, then some tasty little hazelnut and cheddar shortbreads. There were also kale chips with smoked paprika and cheddar, which surprised me-I've never been a fan of kale, but these were actually quite tasty. I may have to make some for snacks! I'm thrilled that we were given the recipes because I can't wait to try them, especially the dip! Wait, where was I? Oh yes. The festival. The Cheese Rolling Festival is loads of great fun for the family, with some races for small kids, lots of cheese tasting, a costume contest, activities for the kids, cheesemakers to talk to, and lots of cheese to buy. Best of all, it's free! We love taking a ride up to the village along the Sea to Sky highway and looking at the spectacular scenery. There's a lot to do in Whistler during the summer, and hotel rooms are pretty reasonable this time of year so you can even go and spend an evening with the family, take a wander around the village, and check things out. You don't have to chase cheese to have fun, you can wander by and watch the action-from the looks of it, the races are very entertaining to watch-and if you're wearing a costume, there's some really fantastic prizes to be had! 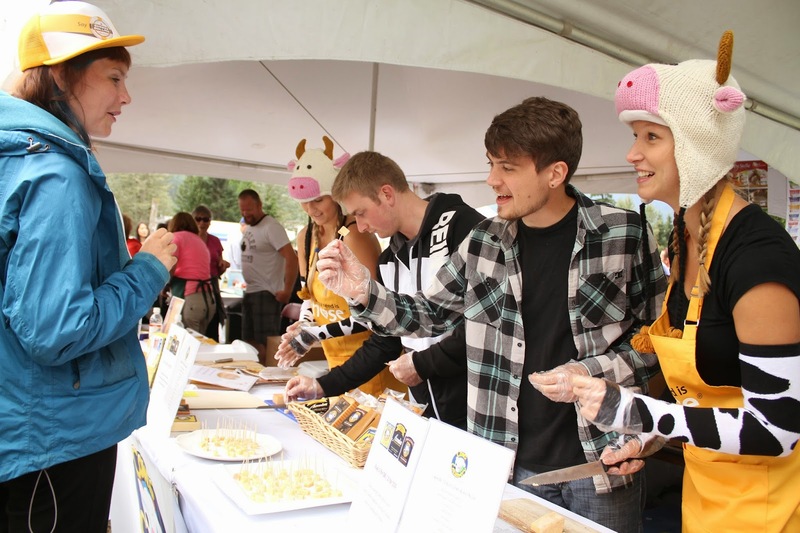 There's a little something for everyone at the Canadian cheese rolling festival-especially lots of really tasty Canadian cheese. You'll find more details about the event at the Canadian Cheese Rolling Festival website.